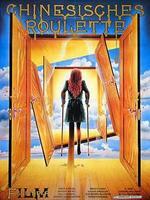 Chinese Roulette is a 1976 West German film written and directed by Rainer Werner Fassbinder. It stars Margit Carstensen, Ulli Lommel and Anna Karina. The film, a bleak psychological drama, climaxes with a truth-guessing game, which gives the film its title. The plot follows a bourgeois married couple whose infidelities are exposed by their disabled child. American critic Andrew Sarris devoted an entire university course to the analysis of Chinese Roulette.